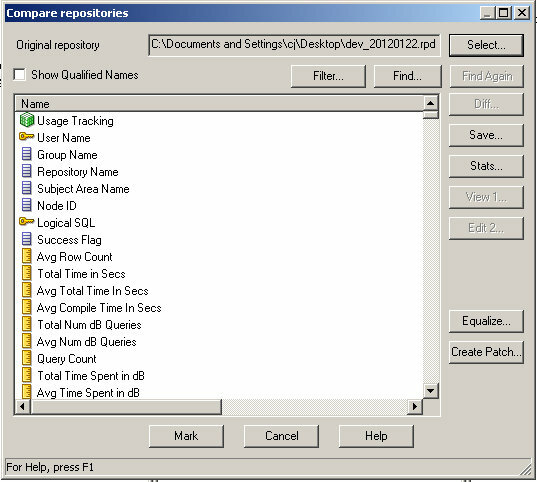 OBIEE 11g: Where's the Compare Repositories Dialog? 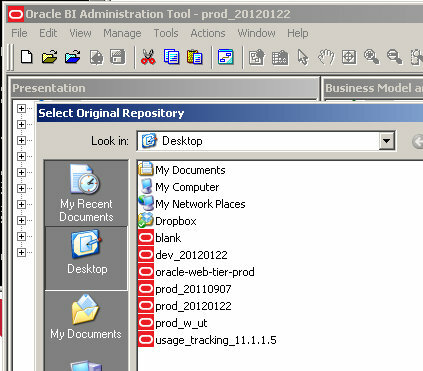 Recently I decided to try out the new patching capabilities for the metadata in OBIEE 11g. The big reason for me was to avoid having to reset my connection pools. Each time I did a 3 way merge, the connection pools would get over-written with their development credentials. When I was doing the merge, I could never find a way to isolate (leave out) those objects, so it was off to try the patching. What this patching does is creates an xml file of the differences between 2 RPDs. You can then edit that XML file if you so desire. Most of my duties over the last couple of years have centered around the RPD and front-end stuff, not nearly as much on the administrative side (i.e. migrations). So I need to catch up with the rest of the world. Reading through the docs, I'm told that I need to use the "Compare repositories" dialog. OK, easy enough. Where is my entry for it? OK, let's try the Compare entry. 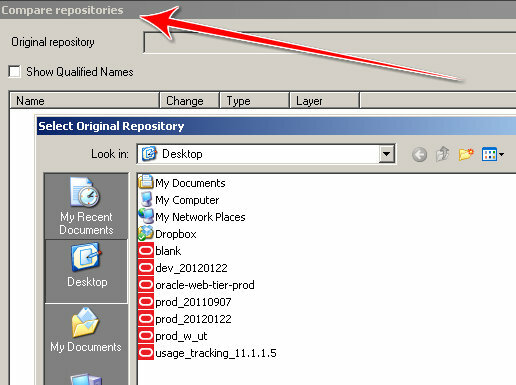 Since I'm using the prod_20120122 RPD, I select the dev_20120122 RPD. OK...where's the Compare Repositories Dialog like the docs say? I see the icons have changed signifying differences, but no dialog as mentioned in the docs. What if I select No? 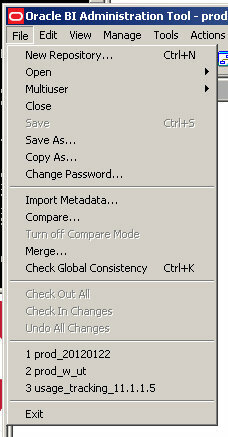 Interestingly, if I maximize that Compare Repositories Dialog, the next time I run the Compare, I can see it plain as day. Hopefully you'll find this next time you endeavor to learn how to patch your RPD and can't seem to find the Compare Repositories Dialog.